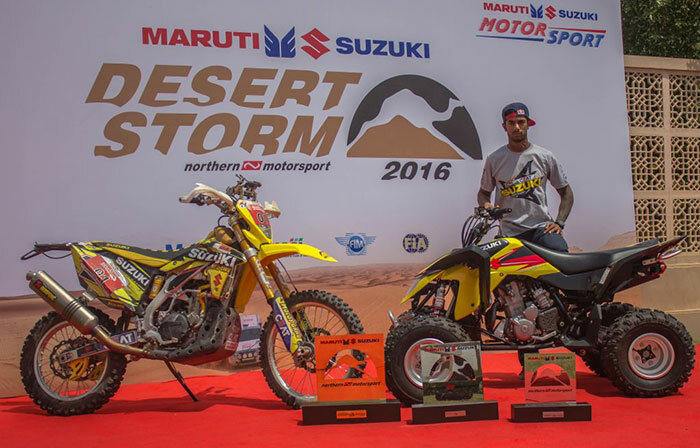 Suzuki Motorcycle India Private Limited (SMIPL), a subsidiary of one of the world’s leading two-wheeler manufacturers, Suzuki Motor Corporation Japan, teamed up with India’s best rally-raid rider CS Santosh, to take top spot in the Moto Class at the Desert Storm 2016! CS Santosh defended the champion’s tag in the Maruti Suzuki Desert Storm in style as he powered his Suzuki RMX450Z Rally to a facile win in the Moto class by a handsome margin of over nine minutes ahead of many worthy competitors after close to 800 km of racing in soaring temperatures and testing conditions. 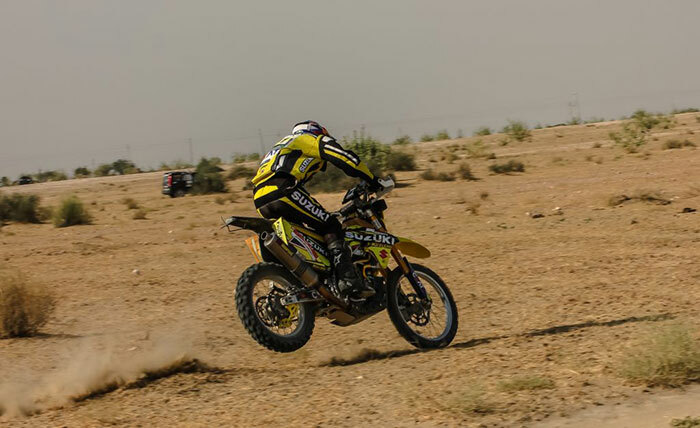 Santosh prepared for the grueling rally by practising on the Suzuki Quadsport Z400 quad bike. But unlike his two previous wins in the Maruti Suzuki Desert Storm, his third victory in the 2016 edition, considered to be one of the toughest cross-country rallies in the country, came amidst high drama in stages 10 and 11 that ran in the night over a combined distance of more than 100 km. Santosh, who took command of the rally right from the first leg, opened up a massive lead of 53 minutes after nine stages. However, on the 10th stage, which was the first of the two night stages, the Suzuki-supported rider failed to spot the passage control to get his time card stamped for reasons of bad visibility due to the dust kicked up by the cars ahead of him, was slapped with a penalty of 60 minutes for the infringement. But Santosh went into the final 2 stages with a hugely motivated charge to finish with an overall lead of 9+ minutes for a total time of 11 hr 19 min 28sec to seal his win. 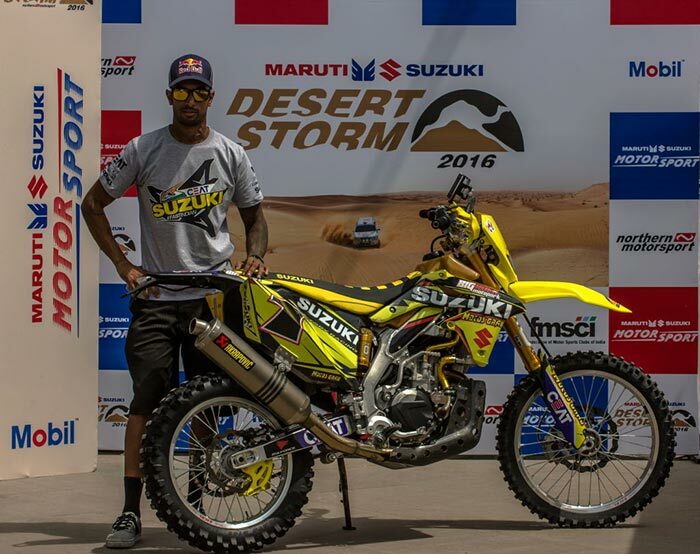 For the 2016 Maruti Suzuki Desert Storm, the two-time Dakar participant rode the rally edition of the Suzuki RMX450Z, which carried special parts from the Dakar version of the motorcycle. Among the changes include a carbon-fibre sub-frame that also serve as auxiliary fuel tanks, Ohlin suspension system and bigger cooling system. For this rally, Jordi Grau, who runs the Suzuki Spain Team in the Dakar Rally, came down to lend his technical expertise.